Write Apartment Science down on the guest card and rental application as your referral source/locator. Commission paid by apartment complex to Apartment Science must be at least $750. Provide a valid mailing address when you report your lease online. 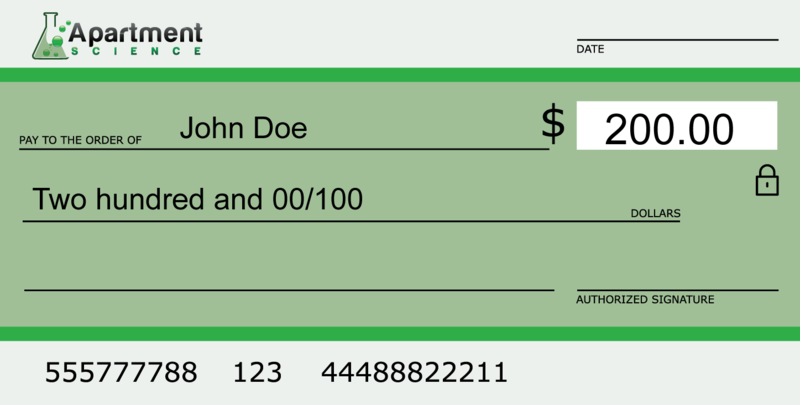 Your apartment locator rebate check will be mailed within 5 business days after Apartment Science receives payment. Commission paid by apartment complex to Apartment Science must be at least $350. Commission paid by apartment complex to Apartment Science must be at least $250. Rebates take 8-10 weeks from the date you move-in to be processed. Typically rebates are paid 2 weeks from your move in date, but some properties like to receive at least 2 months rent from you before paying Apartment Science a commission. Apartment Science pays rebates promptly once commission is received. *You must report your lease on www.apartmentscience.com within 90 days of moving in to your new apartment, or you will be ineligible to receive a rebate. **Any questions regarding this rebate policy should be sent via e-mail to info@apartmentscience.com with a subject line of “Rebates”.